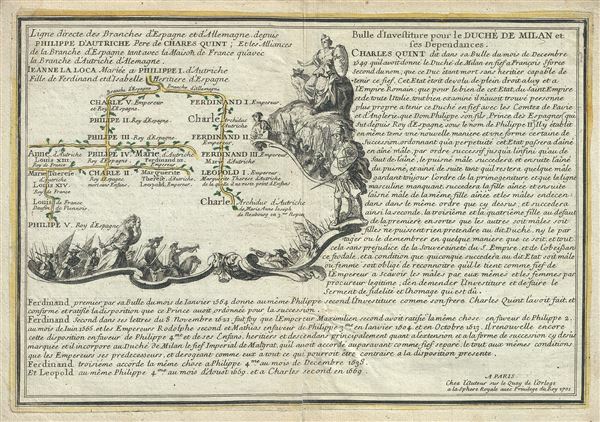 Ligne directe des branches d'Espagne et d'Allemagne depuis Philippe d'Autriche Pere de Charles Quint; Et les Alliances de la Branche d'Espagne tant avec la Maison de France qu'avec la Branche d'Autriche d'Alemagne. This is a fine 1701 map of the lineage of Philip I of Castile. It notes spouses, and children, and succession as well as title and alliances mapping their rule in Spain, France and Austria. The two sons of Philip I went on to rule the Spanish Empire (Charles V) and the Habsburg Empire (Ferdinand I). Philip II inherited the Spanish crown from Charles V which would then pass to his son Philip II and his grandson Philip III and so forth. It goes on to map the ancestry of Philip V of Spain and Charle, Archduke of Austria. The family tree or pedigree chart, in the top left quadrant is surrounded by a beautifully illustrated cartouche, while detailed information is included in the right and lower parts of the sheet. This map was issued by Nicholas De Fer in his 1701 Atlas. Very good. Minor wear and verso repair along original centerfold. Original platemark visible.